One of the trees which dot the landscape of Belize, southern Mexico and Guatemala is the sapodilla (Achras sapota). This species is tall and straight and its wood is extremely hard. The sapodilla tree also produces a thick white sap when its bark is cut; this sap is called chicle. In 1866, an American (Mr. Thomas A. Adams Jr.) was introduced to the chicle gum by a Mexican official (Landon, 1935). Chicle was traditionally chewed by the Mexicans to stimulate salivation and relieve thirst. Within twenty years, the Wrigley Company, the Beechnut Packing Company and the American Chicle Company became major players in what developed to be a major industry in the U.S.A., Belize, Mexico and Guatemala. Chicle was used in Spearmint chewing-gums, surgical tape, for dental supplies and as a base for chemical manufacture. In Belize, four types of chicle were known: Female, Crown Gum, Male and Bull Chicle. The superior female chicle was more abundant in the north, while crown gums came from the south. The other types were considered adulterants. The technology of chicle extraction changed very little over the course of the industry which started in the late 1880s. The chain of custody of the product included the chiclero, the foreman and the contractor to whom the chiclero sold. In addition to the contractors there were exporters who marketed the product to the international buyers. Notable chicle exporters in Belize’s history included Mr. Robert Sydney Turton and the B.E.C. 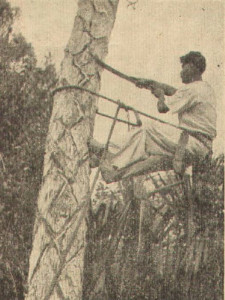 In order to tap the chicle tree, the chiclero would climb the tree and make cuts in the bark of the tree (Figure 1). To climb the trees, the chiclero placed a padding of sugar bags behind his legs below his knees. He then buckled his iron spurs around his ankles and fastened the long flat extension around his calves. The spurs were on his instep and these were stamped into the bark as he climbed the tree (Figure 1). 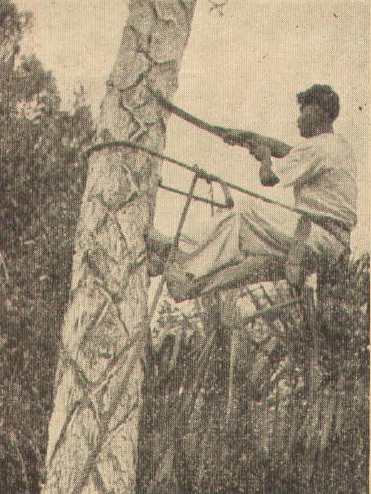 The chiclero then tied a rope around his waist and the tree before placing padding on the rope behind his back. To extract chicle from the trees, the chiclero first tested whether the tree contained sap. This was done by cutting a groove in the bark of the tree at waist height. Upon observing a flow, the chiclero would make a deep upward cut at waist height. This would create a lip under which a waxed sap bag was placed and held open by a small stick. To tap the tree, deep V shaped cuts were made into the bark. These cuts were arranged around the tree in a continuous spiral. A more conservative technique used by some chicleros was a number of smaller spirals. Cutting of the bark was done in the mornings and collection of the bags was done in the evenings. The bags from individual trees were placed in a larger deposit bag for processing on the weekends. Processing of chicle entailed cooking of the raw product in iron pots until the proper consistency was achieved. While the chicle was still warm, it was placed into moulds. The chicle would then be collected and shipped to Belize City in pitpans or on the Cayo boats (Figure 2) which started to operate around 1904. On the return journey from Belize City, provisions of salted meats, milk, flour, sugar, kerosene, etc. were brought to the out-district towns. In the days of pitpans, this was an arduous journey sometimes taking as much as 20 days from Belize City to locations like El Cayo. In those early days, vessels could not traverse the Belize River because of the rapids along the course of the river. To overcome this impediment, a decision was made in 1902 to begin blasting rocks in the shallows of the Belize River. This enabled regular motorboat traffic to El Cayo. Thus, the difficult era of pitpan transport on the Belize River was coming to a close when Captain Shepardson reached Banana Bank in the Clarence Mengel in 1904. The following year, the Creole was taking dignitaries as far west as Benque Viejo del Carmen.